And you thought the stock Raptor was a bit nuts. Making its debut this week at the Tokyo Auto Salon, essentially Japan’s version of SEMA, is this: a wide-bodied and slammed Ford F-150 Raptor, courtesy of Tra Kyoto, the parent company of . It literally is a lowered and widened version of . 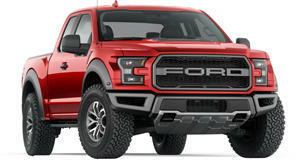 Although it looks, uh, interesting, it also totally defeats the Raptor’s intended purpose: off-roading. There’s almost no ground clearance, which would make off-roading a serious problem. No, this thing is more of a cruiser that would stand out in any city in the world. Aside from its fattened and lowered stance thanks to a lowering kit, the front end receives a Pandem spoiler and a set of wide Toyo Tires. There’s also some questionable body panels that are meant to enhance the look, but we’re not sure they’re really necessary. Also notice there’s some newly added shotgun pipes out back. Based on what we know, this slammed Raptor is a one-off with no, as of now, intention to offer the body kit for sale. It’s probably for the best it stays that way. Just our two cents.